My mother’s traditional recipe for Irish brown bread that I grew up eating. This simple soda bread recipe is made with buttermilk for the authentic Irish taste of home. I have lived in the United States for over 7 years now – and love almost everything about being here… EXCEPT the bread! I have a wheat intolerance to begin with (no white bread for me!) but the amount of preservatives and sweeteners and other junk that is added to bread over here completely puts my body over the edge. I am a breadivore (yes, I just coined that term!). I would eat bread for every meal if I could, so cutting it out of my diet was a no-no. Instead, I turned to the recipe for Irish brown soda bread that my mom has baked since I was a little girl. It’s simple, requires few ingredients and you can whip it together in 5 minutes. It’s also really healthy! Oh, and because it’s yeast free, it tends to be better for keeping my tummy flat too! For an authenic Irish brown bread, you really shouldn’t skip the buttermilk. It adds a certain richness to the flavor and the texture won’t be as good without it. If you’re really stuck, you can use plain yogurt or sour cream instead…or even one of these other buttermilk replacements. In Ireland, my favorite way to eat this bread is with a warm bowl of vegetable soup. Slathered in butter, then dunked into the soup, the bread absorbs all the flavors. I haven’t found a soup over here yet that I really like so I tend to eat it simply with butter and jam and I’m not picky about whether it’s for breakfast, lunch or a snack! It seems that butter and jam is go-to combo, since I also eat my Irish Scones and Irish Soda Bread that way, too! This Irish brown bread is delicious served warm so that the butter soaks right in but it’s equally good cold. The bread will keep for several days as long as it’s stored in an airtight container or covered with foil but don’t refrigerate it as it will dry the bread out. A traditional Irish brown soda bread recipe made with buttermilk. In a small bowl, whisk the egg and set aside. Make a well in the middle and add the buttermilk and egg. Mix well with a wooden spoon until a soft, slightly wet dough is formed. Pour the mixture into a greased loaf tin. Run a knife along the top of the bread in the shape of a cross (lengthwise then widthwise). Sprinkle the top with oats if desired. Bake at 400 F for 35-40 minutes. You'll know it's cooked when you tap the bottom of the bread and it sounds hollow. Store in an airtight container or wrapped in foil. The bread will stay fresh for several days. Do not refrigerate as it will dry it out. Serve with butter and jam or whatever tickles your fancy! If you tap the bread underneath and it sounds hollow, you know it’s fully cooked. 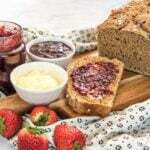 That bread looks so yummy, especially with the butter and raspberry jam spread on it. Recently, our neighbors had a bit of a party where they had beer bread–it was delicious, but, the way it was made, I’m not sure that it was the most healthy. I’ll have to give this recipe a shot and see if my hubby likes it. I hope your husband likes it, Julie! Mine is very fussy about bread and devours it every time I bake it!